Welcome to the GCR2 curriculum site! Our goal is to strengthen our K-12 curriculum alignment with the Missouri Learning Standards in the Gasconade County R-II School District. We support these efforts by providing opportunities for teachers of elementary, middle, and high school students to work together and share their expertise. This site is an extension of that goal, as we hope it will make the K-12 curriculum more accessible to teachers and parents. The GCR2 School District strives to provide accurate, timely, and transparent communication for the purposes of increasing understanding about the public education system. The Curriculum, Instruction and Assessment Department is dedicated to student learning and achievement in the Gasconade County R-II School District. Through the perpetual improvement of district curriculum and instructional programs, our goal is to provide educational opportunities rich with rigor, thus cultivating the students of the Gasconade County R-II School District to achieve their greatest potential. Our goal is to support teachers in delivering rigorous, standards-aligned curriculum equitably across the district. Our work directly supports the Successful Schools Framework fundamentals of Quality Instruction & Quality Assessment. The district curriculum is a blueprint that all teachers use to develop, organize and guide instruction to guarantee that neither disparity nor unnecessary repetition exist in a student's learning sequence. Furthermore, teachers use the district curriculum documents to ensure student growth, achievement of required graduate outcomes and fulfillment of the district's mission statement and vision. The district curriculum is a "living document" and is in a constant state of revision and renewal. In addition, every six years the curriculum will undergo an in-depth evaluation, and if deemed necessary through that evaluation, a revision. The evaluation process includes an examination of MSIP guidelines and an analysis of longitudinal assessment data. The goal of the evaluation is to identify both strengths and weaknesses of the curriculum and to use that information to revise the curriculum. Throughout the five years following the approval by the Board of Education and the implementation of the curriculum by teachers, an ongoing renewal process will allow for any adjustments to the curriculum documents that are necessary to improve student achievement. Horizontal articulation encompasses two separate areas. First it involves the arrangement of content across the curriculum. Examples of this might include an integrated curriculum such as relating mathematic content to a science project, or using a social studies story in a reading lesson. Secondly, it involves the coordination of the program of all teachers at a certain grade level or curriculum area. Examples of this would include, all kindergarten teachers meeting to coordinate the program and activities, or all high school algebra teachers meeting to coordinate the content. As we work horizontally we are looking within the same grade level across the district. Vertical articulation also encompasses two separate areas. First it addresses the placement of curriculum elements from one grade to the next, or from the beginning of one grade level to the end of that grade level. Examples of this might include sequential mathematic skills. You need to learn how to add before you can understand multiplication as repeated addition. Basic skills need to be covered before advance skills can be taught and learned. It also insures that there are no learning gaps in the K-12 curriculum. Secondly it involves the planning of curriculum across grade levels. Teachers of 8th grade students need to coordinate content with high school teachers as well as K-3 teachers coordinating with 4th and 5th grade teachers. As we work vertically we are moving between the grade levels with curriculum content. GCR2 Schools’ standards-based education system establishes challenging and appropriate learning targets for all students. We do this in every course, at every grade level, and in every classroom. We use starting the discussion of using standards-based education across the district to ensure our entire students graduate with the critical knowledge and 21st century skills. Standards-based education is the teaching, assessment and reporting of student performance based on consistent and equitable measurements. Standards-based learning provides the foundation for 21st century learning opportunities that prepare students for today, tomorrow and the future. Provides a fair and objective way to evaluate students based on what they have learned while providing the appropriate level of challenge and rigor. Gives teachers a powerful system for teaching. Helps parents be knowledgeable participants in their students’ education. What is a power/priority standard? Power/priority standards are “key learnings” that will prepare students for the next grade level, district, state, and national assessments, and more importantly, for life. 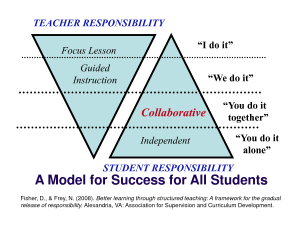 Teachers design their lessons to teach the skills and knowledge that students need to master the priority standards. Students are graded through assessments of their skills and knowledge in each priority standard. Endurance: Standards that provide students with knowledge and skills beyond a single test date. Leverage: Standards that provide knowledge and skills that will be valuable in multiple disciplines or content areas. For example, nonfiction writing prepares a student not only for writing but science, social studies, and more. Readiness: Standards that provide knowledge and skills for success in the next grade or level of instruction.